We have a fully-stocked selection of self storage and moving supplies, including several sizes of boxes, bubble wrap, packing peanuts, rope, rolls of tape, and more. That means you don’t have to drive all over town tracking down moving boxes and other storage supplies (or renting moving trucks & trailers or dollies). 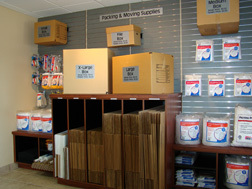 Even better, we offer a 50% DISCOUNT on our storage and moving supplies to Mini Price Storage tenants. So not only are we the lowest cost storage available, we also save you time and money on your supplies! Also, each of our self storage locations is a full-service storage and moving center, with all the supplies and amenities you need to make your move a success. One of the best features at Mini Price Storage is the use of our move-in truck with NO DAILY RENTAL CHARGE. That’s right, we don’t have a daily rental charge to use our moving truck. The moving truck makes it easy to quickly and safely move your items into your storage space in one trip. No more multiple trips with a pickup or trailer, and no expensive rental fees for using someone else’s rental truck. In addition to the free moving truck, we offer free dollies to help you with moving your heavy items into your storage space. This saves you time and effort and helps make loading or unloading your items as easy as possible. Moving items into a storage space shouldn’t be a hassle, and we have the amenities to make the job easier.